The definition of a classic motorcycle is an ongoing debate with no real right or wrong answer. It is something that has been widely debated by motorcycle enthusiasts for many years, with many believing that a motorcycle simply becomes a classic with age. 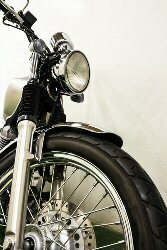 Others often think that a classic is a representation of a certain place in history that would have been considered a state of the art piece of machinery for its time and therefore overall style of the motorcycle itself, its rarity and heritage should also play a big part in driving it into classic status. So what is actually considered as defining characteristics of a true classic? Taking all theories into account, the general rule amongst motorcyclists and insurers is that for a motorcycle to be considered a classic it should be at least 25 years old, ought to be of a traditional look and maintain simple aesthetics. That means no modifications! Whether you are the proud owner a Triumph Thunderbird or a Norton International or are just beginning to contemplate the idea of purchasing the bike of your dreams, motorcycling isn't just a hobby to you, it's a passion. As an enthusiast you are dedicated to a biker's life of maintenance, restoration and classic bike events events up and down the country. So it is important to ensure that you've got the right level of insurance cover. At MotorCycle Direct we offer a dedicated classic bike insurance policy to protect both yourself and your motorcycle. So if you own or are looking to purchase a classic and would like to get a quote, please contact us.